I'm baaack...and I'm exhausted! It's been tough getting used to having a baby again, but so worth it. For anyone who had a difficult labor look away now or be warned that you're probably going to be a little envious. As I suspected my due date came and still no baby. So I went in for my induction and found out that I was already 5 cm dilated. After an epidural (and no real discomfort) and a bit of pitocin I lounged and when the time came pushed for 1 minute. Yes, I'm very lucky! The little peanut is now 2 and a half weeks and so sweet. I could kiss and smell her all day long. In fact, I do. I've missed the blog world, but it's been nice to take the time off. Anyway, thought I'd share a few pics of the fam. My girls together. You forget how small babies are. My four year old looks like a giant! The last pic is just the sweetest. Anyway, I'll be popping in and out with some home progress, but for now I just need to catch some Zzzz's. 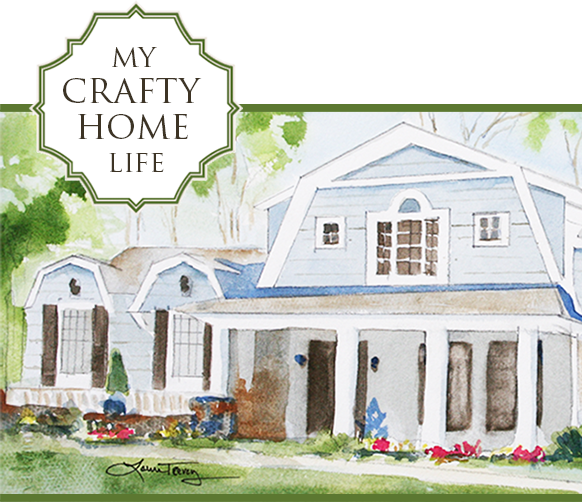 Linda from My Crafty Home Life is participating in the Nester's October 31 days series. She's doing 31 days of Nantucket style and asked me to come up with a Nantucket inspired nursery. Easier said than done but if you want to see what I came up with go check it out. Linda is a super creative and incredibly handy lady so make sure you check out the entire series. I'm a bit of a hoarder pack rat so I never threw out any of my boobear's things. Needless to say I have more than enough clothes/toys/books for the new baby. Not to say I won't buy new things but I don't have to if I don't want to. We have a lot of very generous relatives that spoiled my girl rotten. I think I have some clothes with the tags still on! 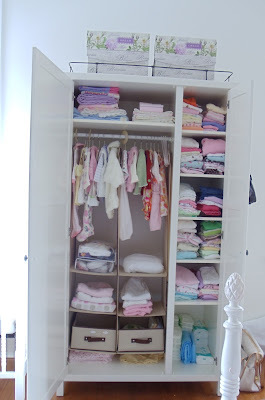 I finally went through everything a few weeks ago to organize for the new little one. 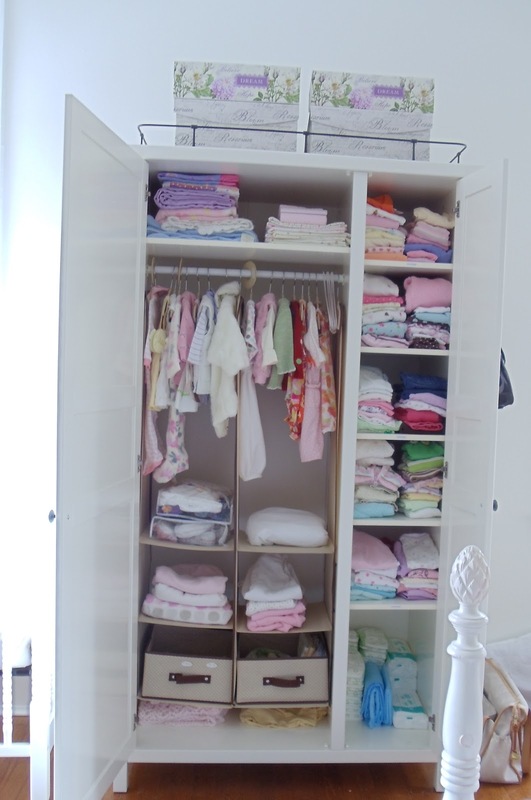 I've got 0-9 months in the armoire and then organized the rest of the clothes up to 3T under the bed. I got the under bed storage boxes at Target. Now everything is clean and labeled. I still ended up with 3 huge garbage bags of clothes that I'm going to donate. I wanted to keep it all, but I had to let go. I just kept the cutest (and stain free) clothes. So I'm feeling somewhat prepared. I don't think you can be 100% prepared for anything, especially a new baby, but I'm comfortable with where I'm at. The due date is this Friday. I had gestational diabetes with both babies now and was induced with my first. Nothing seems to be happening so I'm on the books for another induction this Friday. I don't really mind and kind of like knowing when things are going down. It must be the inner control freak in me. Well my bag is packed so I'll be taking some time off from the house. Wish me luck!